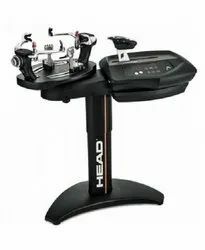 Description: 360° swivel turntable for all-around easy access. Precise electronic tension control from 10-90lbs in increments of 0.1lbs. 2 convenient ways to use: Standing or Table-Top style. These have a size of 1050 mm x 500 mm x 1080 - 1270 mm and weighs about 56 kg. 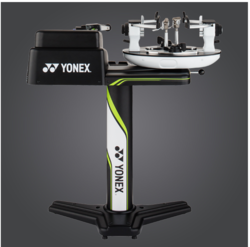 These products have a computer unit with features like touch screen, three traction switches which maximizes stringing efficiency and two speed chunks which reduce extra torsion during stringing. The clamp and rail have been placed together for smoother action and easier maintenance, while the new billiard provides extra-space for easier and delicate handling. 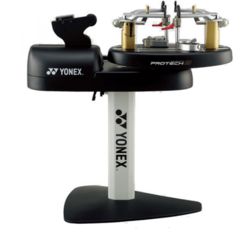 A new attachment has been added for stable racquet setting. The work table provides larger work tray for extra tools along with an adjustable table which can be set from 0 to 15 degrees. The Clamp includes teeth, which minimize the need to straighten strings later. SPEED: According to the elongation of different string, to choose the pulling speed (LOW, MIDDLE and HIGH). PRE-STRETCH: To avoid the tension loss which is caused by string elongation stringing. + & -: For stringing tension adjustment, increase and decrease the tension. KNOT: Press “knot” button which will increase tension of 10% before knot. TOOL KIT: Bag, Calibrator, Starting clamp, Setting off awl, String awl, String cutter, Cutting Pliers, Curved Pliers.